Insightful, down-to-earth articles to accelerate your career and create bigger results! Below you’ll find links to some of my recent articles on the challenges faced by new and emerging leaders today. I hope you enjoy the unusual perspectives and find them helpful. I’d also invite you to use any of these articles, in whole or in part, as content for your own publication if you wish. Just make sure they include the “about the author” section at the end. If it’s an electronic publication, I ask that a live link to my homepage is included as well. 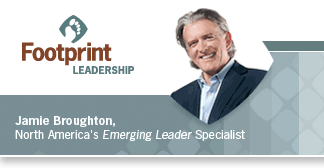 "By Jamie Broughton of Footprint Leadership. If you’re ready to take your career to a new level, please visit Jamie's web site at www.FootprintLeadership.com for additional leadership articles and resources for new and emerging leaders." Please notifiy me to send a copy of your reprint or a link to your on-line publication. You're also welcome to use my photo here on this page if you wish. Once you click the link of an article you wish to read, a pop-up window will appear. I believe the way we do anything is the way we do everything. There's obviously nothing wrong with having a drive to succeed. The problems arise when we get "attached" to the result. As Philip James Bailey suggests, the future lies "...in much less what we do than what we think [and be]." Want to know the secret to dramatically increasing the amount of fulfillment in your life? Becoming unstoppable is about looking past the circumstances to the possibilities beyond them. Life is challenging. This is good news. Once we see and understand this, we transcend it. Warren Bennis, esteemed management guru, studied leadership for many, many years. He found that the common link with all successful leaders was, without fail, having a vision. Go figure. Most of us tell white-lies more than we care to admit. If you're like myself and most of the people I work with, when people ask what we really want in our life...we have an inkling. The third and final component of your success strategy is the "in order to" component. If you want to have access to a "lush lawn" of potential options, you first need to become conscious of your own hard-packed, well-worn "behaviour footpath". An unconscious long-time formula for winning in life. Do You Remember Being Limitless? My daughter Sam, now two and-a-bit years old is a living, breathing example of being limitless. What got you to where you are now is not likely to get you where you want to go. In fact, what got you here will hinder you from going to the next level. Ever felt like you’ve hit a ceiling in the results you’re producing in some area of your life? Mistakes can be awkward things - will you emerge with grace or walk on eggshells? Do These Dragons Hold You Back? Have you noticed that little voice in your head that chatters away telling you what you can or can’t do?